Home > Headlines > News > The three types of Mercedes-Benz Vans. There are several options available when looking for a commercial van, starting with the Mercedes-Benz Vans range. 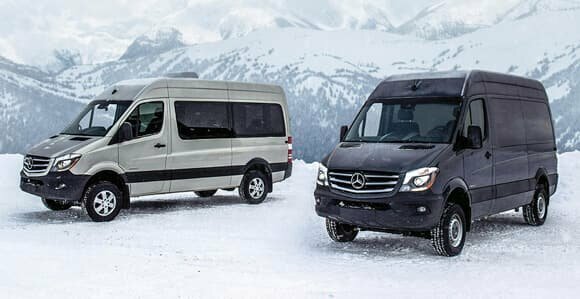 With two distinct models to meet a variety of needs, Mercedes-Benz Vans also offers numerous configurations and customization options. All of this is made possible thanks to the three versions offered in the Mercedes-Benz Sprinter range, and the two versions available in the Metris family. While the Sprinter will meet the most demanding transportation needs and ensure top performance regardless of road conditions, the Metris is much more fuel-efficient and affordable. Let's take a look at the different configurations of the Mercedes-Benz Sprinter and Mercedes-Benz Metris. There are eight Sprinter models and two Metris models in the Cargo version. These were created to carry merchandise and therefore offer a host of customization options for the cargo area. With the Metris, it’s possible to opt for a 126-inch wheelbase out of the gate or a 135-inch wheelbase as an option. When you opt for the Sprinter, you get two height levels for the load compartment, two wheelbases, and three body lengths. In its most spacious and versatile version, the cargo area reaches almost 2 metres in height while the length of the body is nearly 5 metres. The 144-inch wheelbase is standard, while a 170-inch wheelbase is optional. These versions are designed for passenger transport. In the Mercedes-Benz Metris, the Passenger can accommodate up to eight passengers, while the Sprinter can carry up to 12 passengers. The Mercedes-Benz Sprinter Cab Chassis offers a host of configuration possibilities with its aluminum chassis and unobstructed chassis frame rails. Come and meet us today. We’ll help you find the right Sprinter or Metris model for your needs.